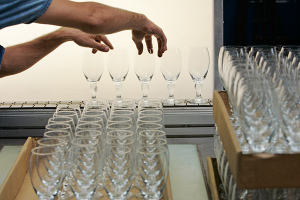 Our growth is the result our extensive quality assurance procedures, which is why we test and inspect our glasses throughout the entire manufacturing and finishing process. For example, the first blanks are sorted by manual selection as soon as they come off the machine. Only bowls that withstand this strict scrutiny are allowed to advance to the second production stage, where the stem and foot are added. After screening in the cooling oven, where all glasses which are under too much stress are rejected, the batches are subjected to further inspections using random sampling. At automatic testing stations up to fifteen different parameters of an individual glass are measured, this data is compared with pre-defined limit values, data is stored and production is carefully adjusted accordingly. This enables us to monitor the natural fluctuations in the quality of the glass – a notoriously difficult material to process – and ensure that the product stays within the specified tolerance limits. It also ensures that each and every glass attains the high quality synonymous with the name of RITZENHOFF; it also explains why RITZENHOFF glasses are so popular and in such high demand worldwide. Our quality management processes allow us to ensure that we can supply our clients with the very best quality glasses, whether they’re based in Brazil or India. Now, more than 30 sales partners ensure that we have excellent contact with our clients all around the world. The advancing pace of globalisation has not stopped at the beer market. For RITZENHOFF this has meant an accompanying strategic alignment to focus on international markets, so much so that the export share is now at over 60%. Thanks to the internationalisation of the business, RITZENHOFF began to look towards the future early on and has succeeded in remaining competitively viable throughout. In doing so, the expansion of international activities has always followed on consistently from developments on the part of the client. After all, meeting the needs of our clients remains the utmost priority here at RITZENHOFF. It is this inimitable combination of personal contact with our clients, familiarity with the market, flexible and cost-efficient production and reliably high product quality standards that sets RITZENHOFF apart and has led to drinks being enjoyed out of RITZENHOFF glasses in over 60 countries all around the world. This concept, coupled with our desire to continually improve that which we already succeed in, RITZENHOFF will continue to be an extremely strong partner in the future.